Home › Sociology › gender & feminism › 59th edition of the Down Under Feminists Carnival is up now! 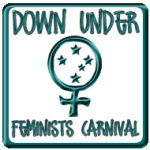 59th edition of the Down Under Feminists Carnival is up now! The lovely Blue Bec is hosting at her blog Opinions @ bluebec.com. The always wonderful Chally has all the details you need here. Thank you so much, Mindy, for getting this up for me when I couldn’t post in exiled space! !